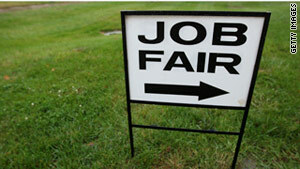 When job seekers bring their résumés to job fairs, they may want to eliminate certain words. LinkedIn's most overused resume terms include "team player," "motivated" and "dynamic"
(CNN) -- With national unemployment at 9.8 percent, Americans are looking for ways to make their job applications stand out. However, peppering résumés with tired or empty buzzwords probably isn't the recipe for becoming a standout job candidate. LinkedIn, the social networking site for professionals, has compiled a list of the 10 most overused terms and phrases within the profiles of its 85 million members. "We wanted to reveal insights that help professionals make better choices about how to position themselves online," DJ Patil, LinkedIn's lead data analyst, said in a statement. Jessica Holbrook Hernandez, president of Florida-based Great Résumés Fast, recently compiled her own list of throwaway phrases. She says she cringes when coming across things like "great communication skills" or "attention to detail." These terms, she writes, "are frequently used on résumés, often by candidates who really don't even possess them. Instead of using these throwaway terms to describe yourself, attempt to outline specific accomplishments."